Welcome back, everyone! Our book is getting so good, isn't it?! This week we read chapters 17-20, and we are officially at some serious action. Go grab your coffee or tea! All right, so we had left off at the trial. Chapter 17 lays out the trial details, and as is not unexpected, the entire thing is the doing of Zevulun, and he has recruited some additional bitter followers that he has worked up into a frenzy about the entire situation. Alexandros is there as a witness. 😡 Shem tries to help, but he is overpowered by the bloodthirsty crowd. Nava admits her guilt. She takes responsibility for her poor choices, and asks for her husband's forgiveness. I really admire the way that she is changing her life. Her husband still loves her, but he is hurt, and allows himself to be dissuaded from his sympathetic feelings by the crowd. Nava is sentenced to death and immediately taken out to be stoned. This scene was amazingly powerful. I have always tried not to think about how a person was actually stoned to death, and this reenactment made it abundantly clear how this will all go down. Shem and his grandfather are trying to help, but we as the readers feel as powerless as they do as they try to fight their way through the ravenous crowd. My heart was beating a mile a minute as I read along. Nava is eventually knocked unconscious by a blow to the head as she tries to protect Asher, who has skirted in to her aid. I think the others believe Nava is dead, and Shem's grandparents take her back to their house in the hopes she could possibly recover. Meanwhile, Mara realizes what happened, and is initially upset that she wasn't made aware of her mother's trial. Everyone settles down a bit as they care for Nava. Mara comes to the realization that the only way her mother will wake up is to be healed. And the first person that comes to Mara's mind as a healer is Jesus. She sets off to find him. Everyone tries to talk her out of it, as Jesus has moved on to Galilee by this point, and the journey would be dangerous for her. She refuses to give up, so Shem accompanies her. He knows that they will face many challenges as they make their way. Mara is in danger as a Samaritan female, and he himself could be recognized from his incident with the Roman soldier. They forge on. I'm worried for them. I feel so upset about Nava. But I'm so happy for her that she has experienced this rebirth in her soul. Her husband came around at the end and tried to save her, and I'm hoping that this means there is hope for their relationship as well. I was so moved by this section of chapters. I can't get over the unjust way women were treated in this society. And the general lack of charity or compassion, which unfortunately carries forward to this day in many ways. I love Mara and Asher so much, and I now feel so bonded to Nava and her struggle to do the right thing. We can all relate to this, yes? What did you think, dear ones?! Next week we read chapters 21-24! 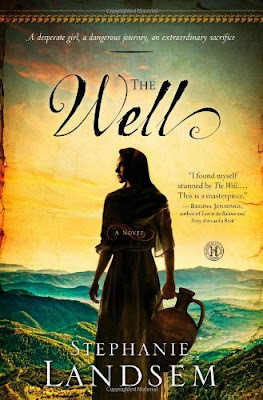 Very thankful for this summer book club because this would not be a book I would ordinarily read on my own, but I've really enjoyed THE WELL so far. The one thing that really stood out to me in these chapters is that Sychar is a very troubled place. This has been made clear since the very beginning of the book, but really came into focus this week. Yet in the brief time of Jesus's visit, I felt it became much safer. Up until his arrival, it seemed like something bad lurked around every corner for Mara, Shem, etc. -- and, after his departure, trouble erupts almost immediately. (I think there's a lesson in there!) Needless to say, I hope Mara and Shem find him quickly and bring some more of his peace to Sychar and all its inhabitants. Kevin, I'm SO glad! I agree, I don't think this is something I would have read had it not been selected for the book club. I'm getting a lot out of it, and we're going to talk about the remaining books in the trilogy as well! I agree about the effect Jesus has on Sychar. And once he's gone, lots of violence and bad goings on proliferate. Anxious to see what happens next. These were such intense chapters to read. Like you mentioned earlier, I had never really thought about the practice of stoning someone. It seems so barbaric - although maybe less so than a Crucifixion. It's clear the Shem cares about Mara and has tried to protect her - maybe good foreshadowing of a 'happy' ending. I also love how Nava's husband waffles back and forth between accusing her and then trying to help her. Isn't this how hard it is to stand alone in a crowd when the crowd expects you to a go a certain way? I did wonder why Nava didn't take the bitter water test? Would it have be to her as a lie - maybe a denial that she'd been forgiven of her sins by Jesus? She didn't take what might have been the 'easy' way out and was willing to die by admitting her sin. I wondered what she was thinking . . . Anyway, very intense chapters but I'll looking forward to reading the rest. I didn't realize this was a trilogy so maybe more reading ahead. I had been watching some videos (not Catholic) called Drive Thru History that describe certain places in the Holy Land and take viewers through some of the places where Jesus walked and lived. It's interesting to put the characters into those places now that I know what some of them actually look like. Donna, yay! *excellent* point about Shaul, Nava's husband. That must have been a very difficult spot for him to be in. He feels betrayed by his wife, and the crowd is encouraging him to go for revenge, but his heart is pulling him in another direction. And great insight about the bitter water test - I wondered about that myself. Maybe she saw it as simply disingenuous to do something she knew had no actual meaning? And also it would feel dishonest. I think that her interior change paved the way for her feelings, either way. So, on the trilogy, I'm thinking that the next volume, The Thief, would be PERFECT for Lent! So hang tight! Yeah I never really thought what it would be like to be "stoned" to death and it sounds awful! I could barely read through that scene in the book. I knew there was more to Jesus in the book looking forward to hearing more as they search for him. I'm plugging away still even though everyone is done ha I got behind on my reading with other summer activities and family in town. No problem, Beth Anne! So glad that you're still reading along and enjoying the book!